For older adults, it may seem as though the die is already cast regarding their odds of developing dementia, but new research from the University of Pittsburgh has identified a dementia risk factor among older adults that should be modifiable even well into old age. The study, which draws on data collected from following hundreds of elderly Pittsburghers for more than 15 years, was published today in JAD. A hypothesis which has been the standard way of explaining how the body develops Alzheimer’s Disease for almost 30 years is flawed, according to a University of Manchester biologist. 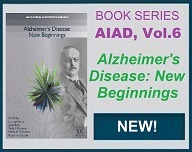 The ‘Amyloid Cascade’ argues that a series of stages, starting from the deposition of a starch-like protein called amyloid and ending with dementia, should be reassessed. Prof Andrew Doig’s review of 120 scientific papers finds that the stages were not linked together in a cascade and the progression to dementia was not linear. 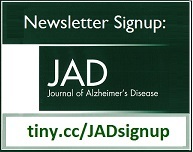 In a breakthrough human study published in JAD, anti-oxidant glutathione (GSH), which protects the brain from stress, has been found to be significantly depleted in Alzheimer's patients compared to normal subjects. As GSH is a very important anti-oxidant that protects the brain from free radicals, the findings give us another measure to use when diagnosing potential for the advancement of Alzheimer’s disease or recognizing those that are in the throes of Alzheimer’s advancement. 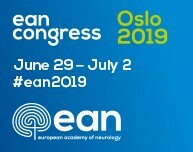 Can a Novel High-Density EEG Approach Disentangle the Differences of Visual Event Related Potential (N170) in People with Subjective Cognitive Impairment? 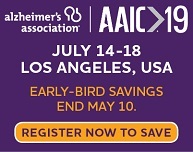 Greek researchers investigated whether specific brain regions, which have been found to be highly activated after negative facial stimulus, are also activated in different groups of people with subjective cognitive impairment (SCI), mild cognitive impairment (MCI) and Alzheimer’s Disease (AD) compared to healthy controls (HC). 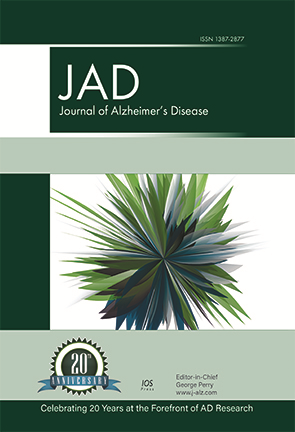 To keep our JAD editors, authors, and readers informed of JAD's progress and development, the journal hereby shares the 2018 editorial update. In the largest known brain imaging study, scientists from Amen Clinics (Costa Mesa, CA), Google, John’s Hopkins University, University of California, Los Angeles and the University of California, San Francisco evaluated 62,454 brain SPECT (single photon emission computed tomography) scans of more than 30,000 individuals from 9 months old to 105 years of age to investigate factors that accelerate brain aging. SPECT tomography) evaluates regional cerebral blood flow in the brain that is reduced in various disorders. Osteoporosis is estimated to affect 200 million women across the world. In Germany, the prevalence of this chronic disease among people aged 50 years and older is around 15%. In recent decades, several authors have analyzed the impact of osteoporosis on the risk of cognitive decline, but, most of these studies have been conducted outside Europe. The goal of the present study was to investigate the impact of osteoporosis on the risk of developing dementia in almost 60,000 patients followed for up to 20 years in more than 1,200 general practices in Germany. Driving is a complex task that involves perceptual, motor and cognitive abilities. These abilities may be affected in early Alzheimer Disease (AD) patients. Nevertheless, they continue to drive for more years than people with other dementia syndromes perhaps because of a deficit in self-awareness that prevents them from perceiving their driving difficulties and adapting accordingly. The purpose of the present pilot study was to closely examine the self-regulation behavior of older individuals with AD using a naturalistic driving approach.